The golden ripe wheat was swaying gently in the breeze. Emerging out of a side lane on the highway was a Sikh in a yellow turban, walking with a typical martial demeanour. On his arm he wore the kara or bracelet and in his holster was a kirpan. Handsome, I thought; and warrior-like. "Khalsa," said my driver, almost in an undertone. Khalsa? Who are they? "They are the most strict, pure, and aggressive of the Sikhs. You will see many of them in this region," my driver informed me. I followed the sweep of his arm to see more Khalsas bobbing past on bicycles, others driving tractors piled high with the day's harvest, school girls with pigtails running in dusty lanes, and every now and then a village straight out of Khuswant Singh's Train to Pakistan. Yes, that's where I was heading: Gurudwara Tarn Taran Sahib, close to India's border with Pakistan. Also known as Sri Darbar Sahib Tarn Taran, the shrine was built at the behest of the fifth Sikh Guru Arjan Dev in the late 16th century. In 1590, Guru Arjan Dev "set out on a tour of the country between the rivers Ravi and Beas." He chose a spot, bought the land and laid the foundation of a gurudwara in honour of Guru Ram Das. He also got a sarovar or water tank built there and called it Tarn Taran. We entered the town of Tarn Taran to a typical Indian marketplace: Vegetable vendors jostling for space, snarling traffic and cows frozen in time like Nandi sculptures. As we drove through the archway, the music changed — Punjabi pop gave way to the slow, lilting tunes of shabad kirtans. Our car suddenly took a sharp turn and stopped. Right in front of us was a lane decorated with streamers; on one side were shops selling books and music, beads, karas and items used in worship while on the other was the wrought iron fence of the gurudwara. Tarn Taran Sahib looked so different than other gurudwaras that the first thing I did was to seek more information from Mohan Singh, a retired block education officer who was doing kar seva or service at the entrance. Slowly stroking his silver beard, Mohan Singh said, "This is not the place of any one guru. In Sikhism, we have had 10 gurus, but each of them was only reiterating the word of God in the Guru Granth Sahib — so this is the house of the Guru Granth Sahib." "They come here because their wishes get fulfilled and ailments get cured," Mohan Singh said. The vast expanse of the sarovar is striking; especially if you compare it with the Golden Temple in Amritsar. The white marble walkway that surrounds the sarovar is over a kilometre long. Sikh websites describe the sarovar as "the largest Sikh sarovar in the world." The water of this sarovar is said to have healing properties and is known to cure even leprosy. So a leprosarium came up nearby and soon a township by the name of Tarn Taran. Steps from the circumambulatory passage lead down to the water and some could be seen splashing the charanamrit or holy water onto their faces and dipping their hands and feet in it. Across the sarovar, the structure with a huge copper dome glinting in the late afternoon sun was the Darbar Sahib itself. 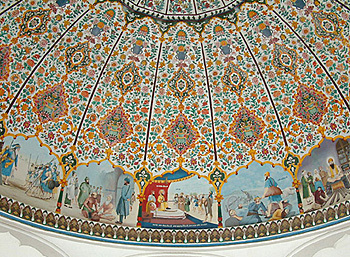 Frescoes at Darbar Sahib, Taran Taran which replaced the Hindu themes from the Maharaja Ranjit Singh period. This was part of Kar Seva in 2006. I soon joined the stream of Sikhs going in. The line moved quickly and I found myself in the shrine room with its opulent interiors. The walls were decorated with intricate stucco work and the ceiling was a dazzle of red, gold and Persian blue. This 'richness' is in contrast to the soberly dressed devotees that included NRIs and peasants. While devotees sat patiently for the ardas to begin, some of them engrossed themselves in their prayer books, while others went up and made offerings to the Guru Granth Sahib that was placed below a golden throne in the front. They stood for a few minutes in front of the Granth Sahib with hands folded in prayer. All this while, the ragis or hymn singers rendered kirtans, one after the other — for there is a tradition here to recite relay-style, dawn to dusk. Those who had completed their prayers shuffled out and I followed them for a chat outside. As we spoke the sun set and the sky and the sarovar turned crimson. The ragis' hymns came in waves even as the gentle breeze created ripples in the water. The Line of Control began to recede into oblivion as feelings of peace and calm washed over me. Arun Ganapathy, Tribune India, Jul 4, 2011.